We all preach the importance of donor retention. Getting a first-time donor to give again can be the hardest, yet least expensive, way to increase your bottom line. There are many ways to go about decreasing your donor attrition rates, but how do you actually communication with your first time donors? People will donate because they feel a need to help and have a level of caring or concern for your cause and mission. In order for them to feel that need, there has to be a connection. 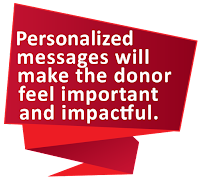 Your messaging towards donors should focus on making that connection stronger and longer lasting. If a donor knows that their gift has made a difference to your organization, they will be more likely to give again. After all, that is the reason they want to help! Use copy that answers the question, "What about me?!"